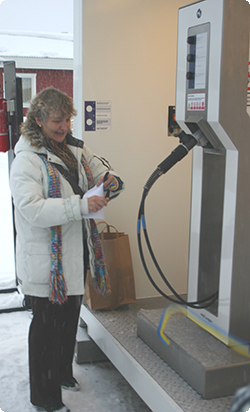 A new hydrogen refuelling station opened on February 1st 2011 in Arjeplog, Sweden. The opening is a result of costumer desire to test their electric cars with fuel cells in cold climates. Several car manufacturers can already show off hydrogen-powered electric cars that have a performance at the same level of a conventional car with a combustion engine. In 2015, hundreds of thousands of these fuel cell vehicles to roll onto the market, according to some of the major car manufacturers. The use of these vehicles in the cold climate of the region will aim to eliminate doubt as to how fuel cells function in the cold and winter climate, which makes the test arena in northern Sweden is very attractive. Over the years, the number of vehicle manufacturers who wish to test the gas-powered vehicles (both light and heavy) in a cold climate has steadily increased. It is considered possible to obtain a sufficient volume for deployment of one or two public stations in this region.